We kicked off April 2016 with three amazing events in our home town of Malton! 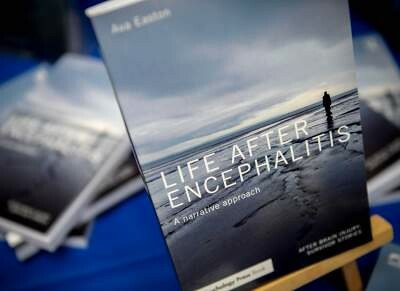 We officially launched Dr Ava Easton's (our CEO) book 'Life After Encephalitis' with a champagne reception, sponsored by Laurent Perrier, at The Talbot Hotel on April 1.There was an amazing turnout of over 50 people who listened to two moving extracts from the book, which looks at the impact of encephalitis and people's narratives. Ava read one extract and Roy a contributor to the book read out his narrative. This was then followed by a Q&A with the audience with some very thought-provoking insights from fellow survivors, family members and supporters of the charity. Following the success of the book launch, 12 guests who had bought a ticket to Tim Bond's Chef's Table then proceeded to Malton Cookery School where they were treated to an amazing three course dinner cooked in front of them. A big thank you to Mel and Gilly from the Cookery School who made sure the event ran smoothly and was an enjoyable evening. The guests were then treated to a goody bag from The Cookery School which featured a bag of freshly ground coffee from Roost - a local coffee house in Malton. Saturday 2nd April saw eight of our Members enjoy a four hour cookery lesson - learning a variety of recipes from our Cookbook - Food For Thought and Brain! A great event which saw a supportive environment in which to practice cooking skills, build confidence and have fun. A massive thank you to Townsend Harrison, Cardale Asset Management and Redmayne Bentley for corporately supporting the event and helping us to create a weekend of activities for our Members and supporters. We would also like to thank Relish Canteen for supporting the event by lending us Tim Bond for these amazing events. We also must thank our charity partner the Talbot Hotel for all they do to support our work and the Malton Cookery School for enabling us to put on this unique event.